Today's review is courtesy of CrimeTime's Bob Cornwell who I hope can be persuaded to contribute again! Back at work after his brief suspension from duty in THE HUNTING DOGS, Horst’s knockout 2013 Glass Key winner, Chief Inspector William Wisting leafs through the case file of Viggo Hansen, whose miraculously preserved body had been found, finally, in front of his TV set, an estimated four months dead. Disturbingly he had been a neighbour of Wisting’s, living just three houses away. A routine investigation has revealed no suspicious circumstances, and Wisting is first inclined to allow the report to be filed. Just then, Wisting’s computer beeps and another case calls. The file remains on the top of the filing tray. But the death of Viggo Hansen proves to be of more immediate interest to Wisting’s daughter Line, an investigative journalist for VG, a prominent Norwegian tabloid. Christmas looms and her own fragmenting family is on her mind. Line would like to know just how the shrivelled body of Viggo Hansen remained undiscovered for four months, especially in a country deemed (in recent UN reports) as one of the best in which to live. UK readers may be reminded of Dreams of a Life, Carol Morley’s memorable 2011 documentary, reconstructing the life of Joyce Vincent, three years dead in a north London bedsit. Meanwhile Wisting’s own investigation develops quickly. A plastic folder found on a corpse discovered in a ‘pick your own Christmas tree’ plantation yields fingerprints identified as belonging to someone ‘Wanted by the FBI’. Ten Most Wanted? Yes. Serial Killer? Yes. This is the eighth book featuring Wisting and his daughter, the fourth since Karen Meek and Maxine Clark alerted me to DREGS (UK, 2011), the first of Anne Bruce’s crisp English translations. Have no fear of entering the series at this late stage. Sandstone have provided, since CLOSED FOR WINTER (UK, 2013) the second title in English, a helpful two-page profile of series developments to date. 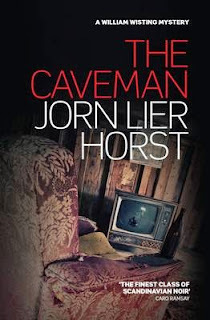 And with Horst recently achieving his first review in the (UK) mainstream press, his time might have come. The two plot strands, of course, complement each other. The cracks in fragmenting modern societies are those in which society’s less desirable elements also live and operate. And, like HUNTING DOGS, those two strands combine to create a well-plotted and surprising narrative of uncommon urgency. Horst writes in pacy, dispassionate prose, the narrative like DOGS divided equally (and a trifle predictably in the middle section of the book) between Wisting’s investigation and that of his daughter. Wisting is observant, methodical, in total command of his team; Line is her father’s daughter, but this time seeking not only facts, but the emotional truth of the life she is investigating . Some readers may be disappointed that whilst Line returns home to live with her father (more easily to explore the life of Hansen, his recent neighbour), the relationship between Line and her father, whilst instinctively protective, remains one of cool (though growing) mutual respect. In fact, consistent with the theme of the book, there is more than a hint that the rules that govern increasingly complex professional lives, may also serve to encourage the space between people. It’s a thought-provoking book – and, as in the gripping climax, an exciting one, as the two investigations merge in a well-engineered and entirely unexpected way. Then, if you haven’t already, do go back and read THE HUNTING DOGS.